In just the span of three years, the Apple Watch has morphed from a product no one really needed the number one watch in the world. And there’s good reason why. The original Series 0 model that arrived in early 2015 showed that Apple didn’t really know why the watch should exist. Combine confusing software, an enormously slow processor, and apps that never belonged on the small watch screen and the device faced an early identity crisis. Apple went back to the drawing board and took a big step forward with Series 2 with a more refined focus on fitness and communication. And with last year’s Series 3, Apple added cellular capability to make the watch a standalone device that could take calls, receive messages, and more without needing a paired iPhone. But Apple is far from done making big improvements to the small watch. 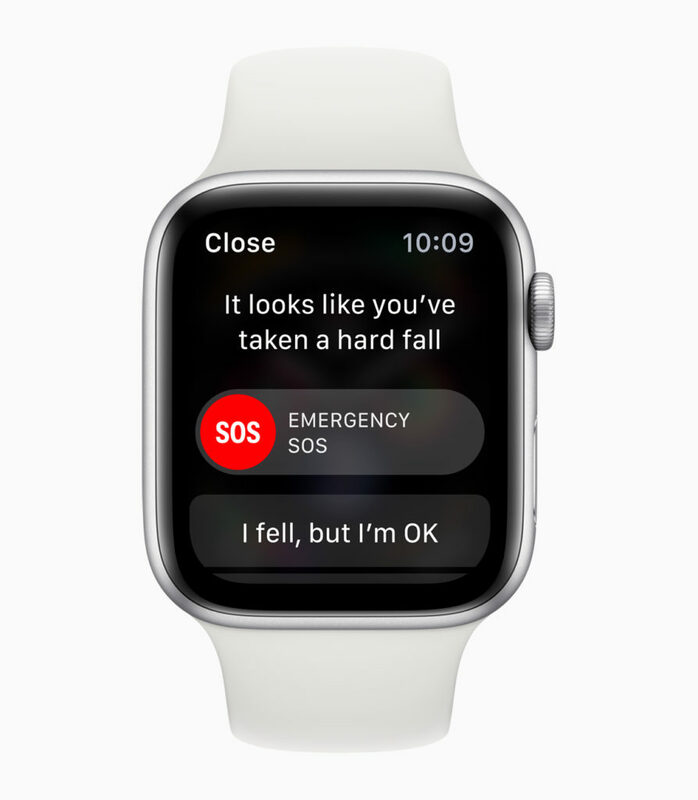 Earlier this month, the company unveiled the Series 4 model with a host of new features, including one that will truly save countless lives. The biggest change is obvious – a larger screen. The previous 42mm is now the 44mm version while the 38mm version jumps to 40mm. All of the extra size was added to the height of the device. That means all of your previous watch bands will work without an issue. And that’s a good call as the thriving band market, from both Apple and third parties is one of the best parts of the ecosystem. Along with the slightly bigger size, the screen area of both watches has been increased by creating an edge-to-edge look much like with the iPhone X line. The 44mm version adds a little more than 230 square mm of display area compared to the old 42mm model. That doesn’t exactly sound like much on paper, but it’s much different in real-world use. Every part of the UI is bigger and much easier to see. The best way I can describe the difference is when moving from the iPhone 5s with a 4.0-inch screen to the 5.5-inch iPhone 6 Plus. It’s a substantial change, and you’ll not want to go back. Even though the watch is bigger, it’s not something that’s readily apparent when wearing. The new model is almost 1mm thinner than the Series 3, so that’s a big help. 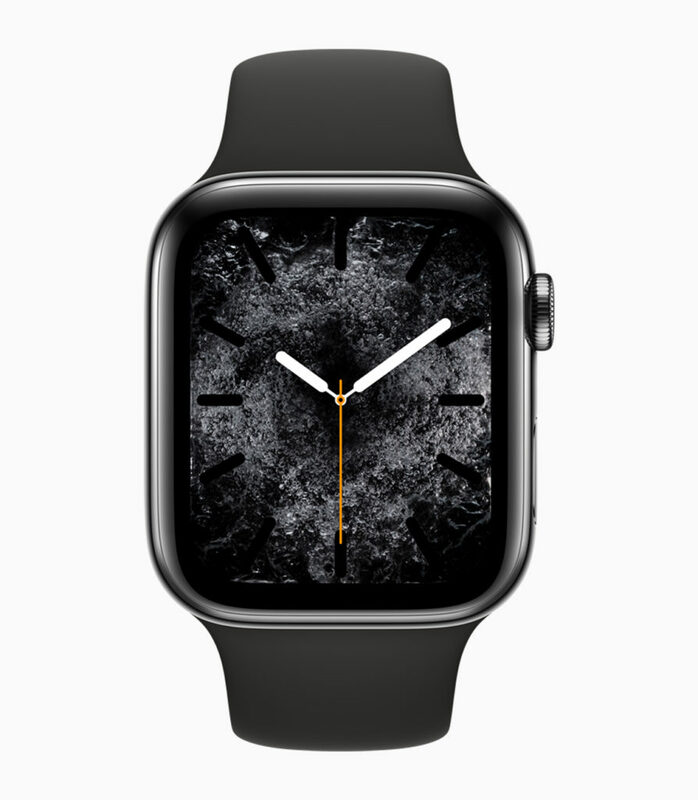 With the larger screen, Apple has thankfully added two new watch faces exclusively for the new model – Infograph and Infograph Modular. A completely new option, Infograph has been the face shown off on many off the Apple marketing shots. Along with the time, you can add an astounding eight complications to the face – four inside the watch circle and four around the exterior. Complications, small bits of information from third-party apps and Apple’s own built-in options, have quickly grown to be a major part of the Apple Watch experience. And the Infograph face is a sight to behold. While it obviously won’t be the top face choice for everyone, anyone who is looking for tons of customizable information with just a raise of their wrist will want this option. The Infograph Modular option is redesigned take on the Modular face for older models. 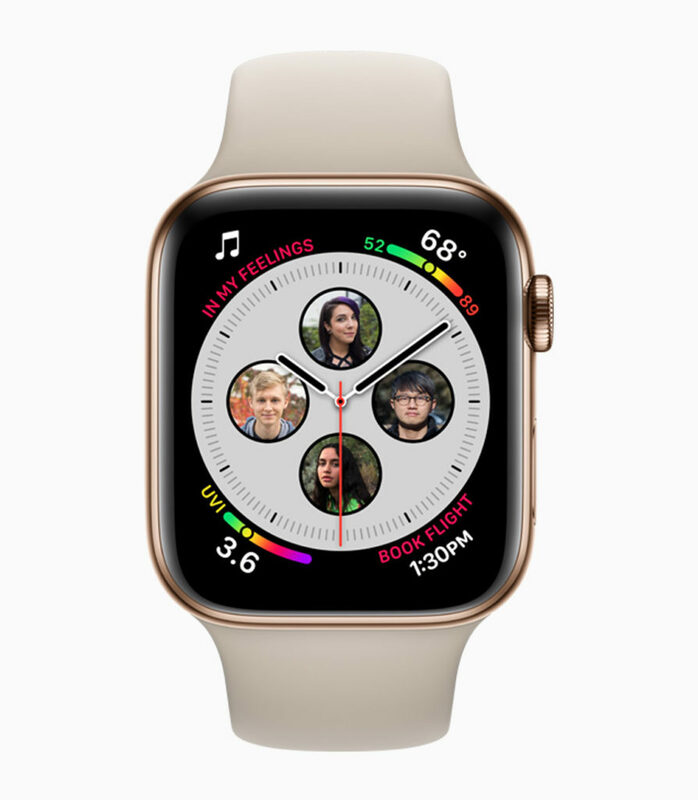 There are five different complication slots, the most notable being the larger option in the center. Anyone who has used the Modular option should be right at home with the redesigned face. Hopefully, third-party app makers will step up and provide compatible complications in the new sizes. Currently, there are only a few scant choices to select from like Carrot Weather, Heart Watch, Things, and Pedometer++. But I suspect other popular watch apps will jump on board soon. 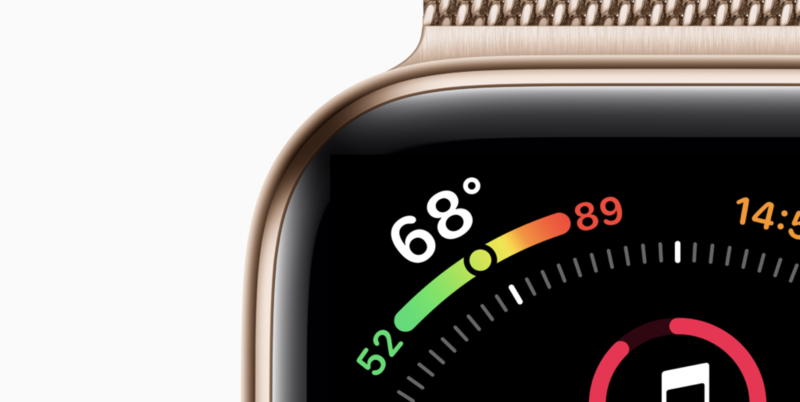 While available to anyone with watchOS 5, the Vapor, Fire/Water, and Liquid Metal faces offer a bit more on the Series 4. The animations, filmed with real-world effects instead of computer graphics, take up the entire screen and look fantastic. You can’t add any complications in the full-screen version, so it’s a great opposite to the dense Infograph faces. 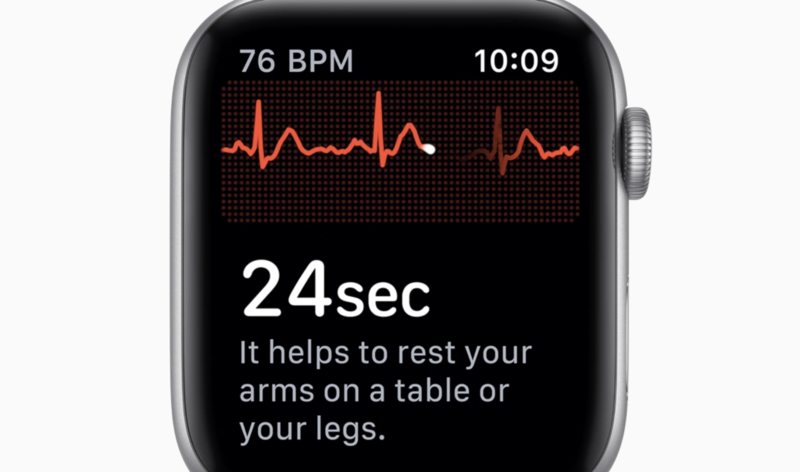 Along with the bigger screen, the other headlining feature of the Series 4 model is the ability to register an electrocardiogram. The feature isn’t ready just yet and will be arriving just in the United States later this year. But when it arrives, it’s prime to very well be a game changer. You’ll just place a single finger on the redesigned Digital Crown, and in 30 seconds, the ECG will be complete. An ECG is a great way to examine the health of your heart as it can detect substantial issues that are hard to diagnose like atrial fibrillation. All the ECG info will be stored in the Health app so it can be shown to a doctor or other medical professional. Previous generations of the Apple Watch have already saved lives by informing wearers of issues like irregularly low or high heartbeats. But the ECG functionality takes health monitoring to a new level and will definitely save even more lives. Another unique addition is fall detection. Only turned on by default for users 65 and older, the improved accelerometer and gyroscope can detect when someone has taken a hard fall. When that happens, an alert will pop-up on the watch to dismiss it or call emergency services. If there is no answer after 60 seconds, the emergency call will be placed automatically and a message with a location will be sent to emergency contacts. Especially for the elderly, hard falls can be devastating. So that feature can give older users, and their children, a little more peace of mind. I received my cellular-equipped Series 4 just two days before heading off to a trip in Las Vegas. So I’ve been able to try out the new watch, with and without my iPhone, while seeing the sights and losing money in Sin City. One feature of the Series 4 you might not have heard about is the redesigned back. It’s now made completely from ceramic and sapphire crystal. That allows the cellular signal to pass through the front and back of the watch. And I’ve definitely noticed an improvement at home and in Las Vegas – even while using Siri. Speaking of Apple’s virtual assistant, using Siri with Series 4 is a bit better than with previous models. One nice new feature in watchOS 5 is the ability to talk to Siri by just raising your wrist instead of also needing to say “Hey Siri.” That’s a big help. You can also interact with Siri Shortcuts on a watch. While the cellular-enabled version is a costly luxury, especially with the $10 monthly charge from most carriers, it’s nice to know that most users should see improved reception when out and about. Another nice feature is the speaker that’s now 50 percent louder. That makes a big difference when making a call or using the new Walkie Talkie feature in watchOS 5. The microphone has also been moved to the other side of the watch between the Digital Crown and Side button to reduce echo and provide better sound quality. Even with the larger screen, battery life hasn’t taken a hit with the new model. Apple promises up to 18 hours of use. And while testing it in Las Vegas for a full day and using the cellular mode extensively and tracking one workout in the gym, I ended the night with a little more than 20 percent battery life. Without cellular use, I suspect the watch can easily go for two days with light use before needing to be charged. The larger screen and other features do come at a cost. The Series 4 now starts at $399 for a 40mm aluminum GPS version. Adding cellular capability increases the price $100 so a larger 44mm version is $529. You can select from a space gray or silver version. Nike+ models, with the exclusive faces and other perks for runners, are the same prices as the aluminum counterparts and will be available starting early next month on Friday, Oct. 5. 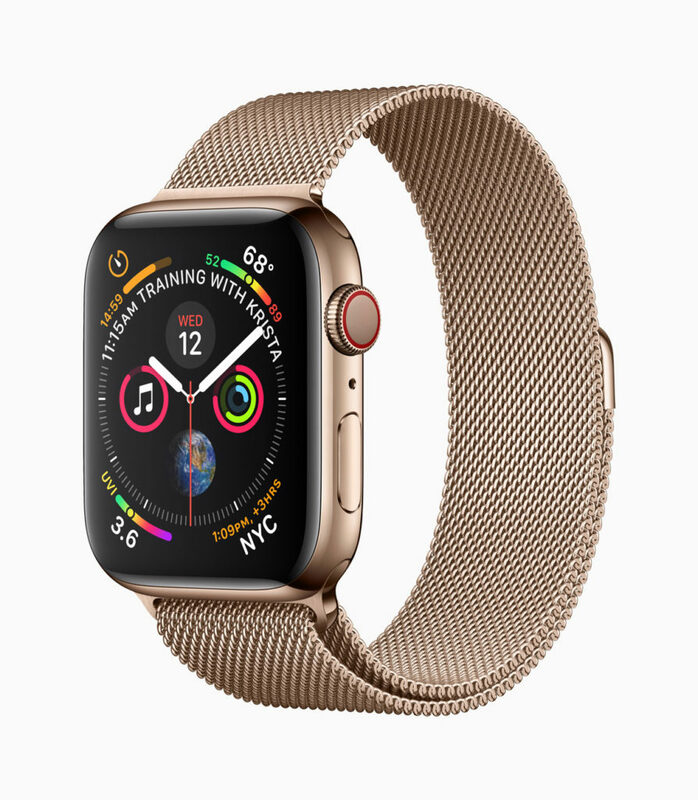 Higher-end stainless steel models, including the new gold tone, start at $799 for the 40mm model and tops out at $849 for the 44mm version with Milanese Loop. You can’t buy those without cellular capability. Apple has also done away with the pricey ceramic Edition models. But the Hermès line is still available if money is no object. Anyone who has been on the fence about finally jumping in an making an Apple Watch purchase should definitely take a long, hard look at the Series 4. Apple has finally made a worthy product in its own right. And with a slew of new features, newcomers should be thrilled with their purchase. If you currently own an original, Series 1, or Series 2 model, it’s hard to go wrong making an upgrade. 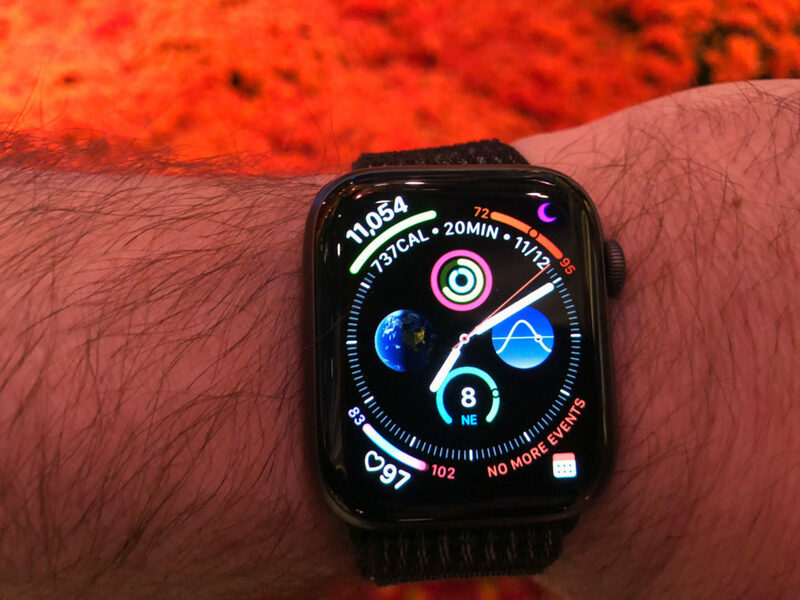 While the larger screen will draw you in, the faster, 64-bit S4 processor and watchOS 5 combine for a fast and fluid experience we’ve come to expect from the combination of Apple hardware and software. The case for an upgrade is a bit murkier if you own a Series 3 model. While the screen of the Series 4 is a welcomed improvement, anyone who doesn’t strongly need the ECG and fall detection features should be just fine holding off for another year. As the smartphone market continues to mature, the “wow” factor of new features and improvements continues to become less and less. But that’s not the case with Apple Watch. Apple has done a remarkable job pivoting away from its original vision and creating a device that any iPhone user should want to have on their wrist. It’s been a great ride so far, and I can’t wait to see what Apple has in store for future models. For now, I’ll be enjoying my Series 4 and patiently waiting for the day that craps tables and cocktail waitresses start taking Apple Pay. Then I can finally go broke in Las Vegas with my wallet and iPhone safely tucked away in my hotel room safe.